The TS-873 is powered by a high-performance and energy-efficient AMD R-Series CPU and provides two PCIe slots for greater functionality. You can install a QNAP QM2 expansion card to add M.2 SSD caching/10GbE connectivity; a compatible wireless card to use the TS-873 as a wireless access point; and an entry-level graphics card to boost system performance for 4K video performance. The TS-873 allows you to flexibly deploy a wide range of applications with a more affordable budget. Equipped with a next-gen AMD R-Series RX-421ND quad-core 2.1 GHz CPU (Turbo Core up to 3.4 GHz) with up to 64GB dual-channel DDR4 RAM, the TS-873 enables lightning-fast multi-tasking with low power consumption for up to 2347 MB/s throughput with a 10GbE configuration. With a hardware-accelerated AES-NI encryption engine, the TS-873 also provides unmatched encryption performance in its class (up to 2310 MB/s with AES 256-bit full NAS volume encryption) to boost system performance while ensuring the safety of sensitive business data stored on the NAS. The TS-873 supports the innovative QM2 PCIe card that allows for adding up to two M.2 SSDs. You can configure SSD caching, or create a RAID 5 tiered storage along with the two M.2 SSDs in the NAS*. As these M.2 SSDs will not occupy any 3.5-inch drive bays, the QM2 card allows you to maximize both your storage capacity and performance. There are also QM2 cards that include 10GbE 10GBASE-T connectivity to provide SSD caching with high-speed network connectivity on a single card. The TS-873 features SSD caching, and also supports optional M.2 SATA 6Gb/s SSDs (sold separately). Using an SSD cache boosts overall system performance, and is perfect for improving the overall workflow of random IOPS demanding applications such as virtualization. QNAP’s Qtier™ technology also continuously optimizes storage efficiency by tiering files and data across M.2 SSD, 2.5-inch SSD, and high-capacity SATA drives based on access frequency. The new Qtier™ 2.0 features IO-awareness that empowers SSD-tiered storage with a cache-like reserved space to handle burst I/O in real time, greatly maximizing the advantages of SSD. Note: The M.2 SSD is optional. As M.2 SSD operations can easily generate excessive heat, it is recommended to install a heatsink (from QNAP or a third-party provider) on the M.2 SSD. The TS-873 allows for installing a low-power graphics card (powered solely by the PCIe slot) to boost system performance. With a graphics card installed, the TS-873 also enables smoother video editing workflows and supports 4K UHD transcoding to deliver an exceptional multimedia experience. You can also use the QNAP remote control (sold separately) or the Qremote mobile app to use the NAS as a home theater PC. 1. Supported video formats depend on the hardware and software specifications of the devices. Playback capability and quality may vary due to factors including the original file formats/quality, hardware and software limitations, and output devices. 2. Consult the QNAP Compatibility List before purchasing the graphics card. 3. Graphics card will be supported in QTS 4.3.5 (or later) version. Install a compatible PCIe wireless network card (for example: QNAP QWA-AC2600) on the TS-873 and use with the WirelessAP Station app to use your NAS as a convenient wireless base station. Your mobile devices and PCs can directly connect to your NAS for easy access to its services and Internet connection. With modularized multiple applications and functions, QTS enhances management efficiency, personal productivity, multimedia, and much more, making your NAS experience easier, efficient, and more flexible! The built-in App Center with hundreds of install-on-demand apps realizes near-limitless NAS functionality. The new Qboost provides a NAS optimization tool that helps accelerate applications, recover system resources, and schedule applications. QTS breaks the barriers of devices, platforms, and geography to bring you optimized cloud experiences and incorporates advanced features. The app-driven QTS operating system provides solutions for simplifying file backup, management, search, and more. With File Station you can view and manage your files not only from NAS but also from multiple storage devices; the OCR Converter allows you to extract text from images; Qfiling helps automate file organization, and Qsirch helps find files quickly. The TS-873 centrally stores data and various files, and supports SMB/CIFS, AFP and NFS protocols for file sharing across Windows®, Mac®, Linux®/UNIX® networks. Coupled with Qsync - a utility that turns a QNAP NAS into a safe, high-capacity data center for file synchronization - any file uploaded to the TS-873 will be made available for all linked devices, such as computers, laptops and mobile devices. You can sync shared folders and team folders for group file sharing, greatly enhancing the flexibility of team projects and collaboration. Files can be centrally managed using File Station, including files from mobile devices and optical disc drives. File Station also allows you to mount a remote NAS, and transfer files between your NAS and public cloud services for greater convenience. Virtualization Station allows you to run multiple Windows®, Linux®, UNIX® and Android™ virtual machines on the TS-873. You can use Virtual Network Computing (VNC) through a browser to manage the VMs. Virtualization Station is ideal for organizations to run multiple applications on a single NAS. QNAP provides flexible backup and disaster recovery solutions to assist organizations in routine backup jobs with greater cost-efficiency and productivity. Snapshots are essential for NAS data protection, and its block-level operation makes it a dependable method for mitigating the growing threat of ransomware. The TS-873 supports up to 256 snapshots per volume or LUN, and maximum 1,024 snapshots per NAS. With potentially huge storage capacities, high performance, integrated virtualization solutions, and support for snapshots that record the state of the system at any time, the TS-873 is perfect for backing up virtual machines. QNAP’s new QVR Pro surveillance solution allows you to arrange a dedicated, independent storage space for surveillance data on TS-873 and leverage the advantages of scalability and storage manageability from QTS. With QVR Pro, camera management, storage space allocation, camera live viewing and playback is greatly simplified. You can also use the QVR Pro Client mobile app to monitor your cameras from anywhere, or use a USB webcam as an ONVIF network camera with the QUSBCam2 app. Note: QVR Pro supports 8 free channels for surveillance monitoring (expandable to 128 channels with additional channel license purchase). The TS-873 provides an intelligent video management system that assists you with real-time monitoring, video & audio recording and playback with a wide range of customizable settings to safeguard your work environment. You can use the Vmobile app to manage monitored channels anytime and anywhere with your mobile devices, or install the Vcam app to turn your mobile device into a network camera to instantly record to your NAS. Connect 2x UX-800P or UX-500P or 4x REXP-1000 Pro* expansion enclosures. Use VJBOD (Virtual JBOD) to expand your storage capacity by using the unused storage of other QNAP NAS. Up to 8 QNAP NAS can be mounted as local disks on the TS-873. Install your NAS hard drives into a larger QNAP NAS and retain your existing data and configurations. Enable remote access through NAS browsers to access local LAN resources without going through complex VPN settings. CPU: 1 x 60 mm Operating Temperature & Relative Humidity 0 ~ 40˚C ( 32˚F ~ 104˚F ), 5 ~ 95% RH non-condensing, wet bulb: 27˚C (80.6˚F) Security Slot Kensington security slot Note: Use only QNAP memory modules to maintain system performance and stability. For NAS devices with more than one memory slot, use QNAP modules with identical specifications. Warning: Using unsupported modules may degrade performance, cause errors, or prevent the operating system from starting. Supports entry-level graphics card, allowing for 4K video transcoding and output. Note: Support full-height 10GbE LAN card, USB 3.1 Gen2 (10Gb/s) expansion card, QM2 card, PCIe wireless network card or a bus-powered graphics card. 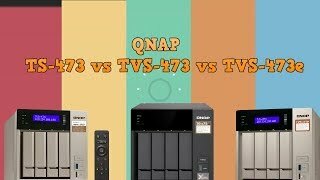 Read more about Qnap TS-873-4G auto tiering. If you buy this Qnap Desktop NAS and hard drives we do free build and test for the unit and hard drives. So you can use this device straight out of the box. All free of charge in TS-873-4G price. When running out of hard drive capacity on the Qnap, REXP-1000 Pro provides an easy way to immediately scale capacity up to 80TB by additional 10 hard drives. The RAID volume on the Qnap Desktop NAS can be expanded directly without having to reformat the existing hard drives, ensuring it continues its service during the capacity expansion. When running out of hard drive capacity on the Qnap, SAS-12G2E provides an easy way to immediately scale capacity up to 0MB by additional 0 hard drives. The RAID volume on the Qnap Desktop NAS can be expanded directly without having to reformat the existing hard drives, ensuring it continues its service during the capacity expansion.